Antony and Cleopatra | LIT.GAZ. I don’t recall meeting any of Shakespeare’s plays until I got to the fourth form and began my O Level Eng Lit course: we studied The Merchant of Venice, with an inspirational English teacher who wasn’t afraid back then to explain everything, including the bawdy bits. I was fascinated to finally be reading this writer whose fame and reputation I’d heard so much about, and I came to love the moral complexities in that play. I can still reel off vast sections which I must have learnt by heart as I revised. It wasn’t until years later that I actually got to see it onstage, and the most memorable performance was one at the West Yorkshire Playhouse in the 1990s, where Portia was played as a woman who was old enough to be worried about being left an old maid, and Bassanio was clearly also no longer in the prime of youth and an evident gold-digger… Sadly, I only had a couple of opportunities to teach the play in my entire career. I was lucky enough, at school, to have been taken to see plays at what was then the revolutionary – in more ways than one – new Nottingham Playhouse, where I was fortunate to see one of Ian McKellen’s first, if not his first, performances as Hamlet. In the end, however, that was a play that I never really warmed to, just as I always found Macbeth somehow unsatisfactory, although if you look up my post on the performance I saw at Stratford last year, you will see that I finally got to see a performance that transformed my appreciation of that play. Although I enjoyed teaching Shakespeare enormously, it was always against the backdrop of examinations, especially with younger students whose enjoyment I feel was sometimes marred by the need to ‘get it right’ for an examiner. I particularly hated having to teach plays for the SATs at age 14 (now long gone, thank God) and felt constrained when Romeo and Juliet was up for testing as it was rather a challenge explaining all the obscenities to students that young… it’s a play much more suited to GCSE. But grinding thorough Julius Caesar or Macbeth with a 75-minute examination in view also felt like a bit of a chore, and at times I wondered how much of a love for the bard the students would end up with. Obviously when students have chosen to study Eng Lit in the sixth form, it’s all rather different: there’s more time to do justice to a play, and students are more thoughtful and mature in their approach, and we could enjoy the language and the jokes, the wit and the vulgarity to the full. We could explore alternative possibilities and interpretations and this was positively encouraged by the syllabus at times. This is where I came to love two plays above all: Othello, and Antony and Cleopatra; ask me one day which is my ‘favourite’ Shakespeare play and it will be one of these two, depending on whether there is an ‘r’ in the month or which way the wind is blowing. Why? Othello for the evil of Iago, the innocence of Othello and the shock when everything that was perfect is turned to dust for him, and the feistiness of Desdemona, until she cannot understand what is happening to her and her husband any more… Antony and Cleopatra for the passion of age that is not youth, and the giving up of worlds for that passion… Both plays for the sublimity of the language. Sometimes I engage briefly with the scholarly arguments about who wrote the plays; most of the time I do not care. Someone – William Shakespeare, most probably – wove and knitted words so magically some four centuries ago that they can take us to places, take us inside people, show us feelings that can take us far beyond ourselves, can entertain us, make us think, move us to tears. It’s all invention, and it’s all wonderful. This is obviously a follow-up to the author’s earlier 1599, which dealt with the context to another significant year in Shakespeare’s dramatic output. Here the focus is on a different reign – that of James 1 – and a different social context, with the background to three significant tragedies, Macbeth, King Lear and Antony and Cleopatra. There is also the fall-out from the Gunpowder Plot of the previous autumn, and James’ ongoing drive for the union of the crowns of Scotland and England. King Lear is set against the backdrop of Britishness which the new kind propounded: Englishness is out with the king imported from Scotland. We are shown the structural complexity of the play – it’s the only tragedy with a fully-developed subplot – and there is interesting exploration of the use of negative language in the play. Context in terms of equivocation, and references the the Gunpowder Plot are all fully detailed, too, as are the many significant differences between the Quarto and First Folio texts. Similarly, James’ obsession with witches and witchcraft, and how this is explored in Macbeth, is very interesting, and again the phenomenon of equivocation is embedded. You will need to read the relevant chapters to get to the bottom of this Jesuitical device for justifying being economical with the truth and how outrageous everyone was supposed to find it at the time. And we realise just how Shakespeare was treading on eggshells writing the Scottish play, during the reign of a Scottish king, depicting two kings of Scotland being killed: both of those deaths take place off-stage, understandably, but not in the spirit of the onstage gore of the times. And this in the immediate aftermath of the plot to blow the king up with gunpowder. There is good depth and detail in Shapiro’s exploration of all three plays he treats in this volume: the context is very enlightening, and surprising amounts of new insights and interpretations, even for me as a long-time student of Shakespeare. There was also a good deal of fairly tiresome and tedious stuff about court masques and entertainments, and despite the title, Shapiro actually spreads his net quite widely, going back at times to the 1580s as well as looking at Shakespeare’s final years. Overall, though, a book I’d very much recommend to any serious reader of Shakespeare. Something got me thinking about heroes recently, and I found myself wondering if I had any. A hero: someone whose life and work I greatly admire; is that a good enough definition? Or am I thinking of an icon? One will have to be Shakespeare. I realise I had a very good first encounter with the man and his work, through an inspirational English teacher (who was ultimately responsible for my pursuing such a career myself) who chose a demanding and challenging play for study at O Level: The Merchant of Venice. Difficult to classify, though many critics call it a tragicomedy, which will do, I suppose. The point is, it raised so many issues for teenage minds to wrestle with: what is justice? What is racism? Who are we meant to sympathise with? In other words, I had an early introduction to the idea that there are no easy answers, and that one should beware of anyone who claimed to have one… And this same teacher went on to teach us Othello and King Lear at A Level, two astonishingly powerful tragedies which move me to tears whenever I watch them. At university we had a course on ‘The Drama’ in our first year, and were fortunate enough to have the lectures on Shakespeare delivered by Kenneth Muir, the head of the Department of English at the University of Liverpool and eminent Shakespearean scholar, then on the verge of retirement. He was amazing: clear and perceptive in his analysis, what stunned us all most was that whatever play he was discussing, he could immediately recall whatever lines he wanted, from memory, as he paced the lecture theatre. Obviously as an English teacher myself, I had to teach many of the plays. I tried only to teach plays I really liked, especially after having made the early mistake of trying to interest year 8 students in A Midsummer Night’s Dream because that was one of the plays designated for year 8… I had to teach Macbeth – a play I liked but never really completely warmed to – more times than I care to think; I loved teaching Julius Caesar and Romeo and Juliet, and when it came to sixth form, went for the tragedies whenever I could, though only ever once managed to get to teach King Lear. Othello and Antony and Cleopatra were my great favourites. Everyone will have their own take on Shakespeare’s greatness. For me there were two things in particular: the astonishing power and beauty of his language in so many different situations and through so many different characters, and his ability to raise so many questions through his plots, to make his audiences think, to make them uncomfortable, in short to make them see that there was no one easy response to anything. I said ‘one’ before I mentioned Shakespeare, so logically there will be another, and there is. ​_Whereas I can claim a certain measure of expertise in the field of literature, in the field of music I am a zero. Tone deaf, unable to play any instrument, bribed at school not to sing in music lessons because I put others off. But my other hero, or icon, is J S Bach. And I will find it much harder to explain why. A long while ago I mentioned how a teacher at school had initially fired my curiosity by refusing to play Bach to us ‘peasants’; another teacher played us the fifth Brandenburg Concerto, and I could not believe my ears, transported by the speed and virtuosity of the harpsichordist. My encyclopaedic knowledge of 1970s rock music gradually began to fade as I explored the world of jazz and classical music, and one fateful day I spent a whole pound on a whim, on a secondhand LP of two Bach cantatas from a stall on Lancaster market. Many years later, having worn it out, I managed to find a replacement. Bach’s music transports me onto a more spiritual plane: that’s the only way I can put it, really. The cello suites, for example, some of the shorter and less fiery organ pieces, but above all the church cantatas take me away from myself, my ordinary little world and its worries and preoccupations and lead me somewhere completely other with my mind – my being, thoughts, consciousness — to another place entirely. It’s beyond me and much more powerful than me; I don’t understand it and I feel unutterably grateful for the experience. Bach was a Lutheran, a very religious and God-fearing man: I am not. As a Quaker, I explore a spiritual path, true, but worship in silence; I don’t know whether God exists or is a creation of the human mind. But Bach’s music speaks to me so profoundly, from nearly three centuries ago, in a way which complements everything I believe in, and manages to restore my faith in humanity. So yes, perhaps there are heroes, and I have a couple of them. I’ve also been lucky enough to have taught this play to sixth formers a good number of times; again, a play I’d never seen on stage till now, although I admire the Trevor Nunn film version which we used to use in the classroom. But I’m utterly convinced now that Antony and Cleopatra is my favourite Shakespeare play, and also that this performance is probably the best Shakespeare performance I’ve ever seen on stage. I was utterly gripped throughout apart from a brief moment during the sea battle scene: I was able once to remind myself that I was ‘only’ watching a performance on a stage, but from my seat in the centre, towards the front of the stalls, I was there, and it was riveting. Given that it’s quite a bitty play in a lot of ways, flitting from Rome to Egypt and back again so many times in a large number of very short scenes at certain points, what made it work here? Simplicity of the set and a clear visual definition of Rome and Egypt certainly helped, as did the pace of the performance – not rushed, but not disjointed either, which helped convince me of the inevitability of Antony‘s disintegration, as Rome slips through his fingers. The sense of tragedy develops surely and certainly from the coincidence, as we see Antony realising as he loses Rome, that Cleopatra is more important to him, the most important thing in his world: I was totally convinced of their love for each other, although this is perhaps harder to detect in Cleopatra, who is empress of Egypt and used to having everything just as she wants it, her every whim satisfied on the instant. For me it worked. Cleopatra is inevitably selfish, never having had reason to be anything else, but I felt she came to realise her love for the man who has lost all, given all for his love of her. 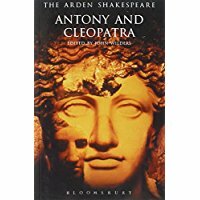 Cleopatra was superbly cast and played, exuding luxury and sensuality and Egypt, Antony and Octavius were very convincing and Enobarbus, whom it’s impossible not to love, was outstanding. Even his death, which must be one of the hardest to carry off effectively onstage nowadays (he dies of a broken heart) convinced. And I came to understand much more about Cleopatra’s women too, their love, loyalty and devotion to their queen shown through the adoration in their eyes fixed on her and ready to respond to her slightest look, word, gesture or whim. For me, the sense of tragic waste with the death of Antony, and then of his lover, was full and complete. It was marvellous to hear the gorgeous language that Shakespeare poured into this play delivered so effectively and powerfully; the stagecraft was astonishing and it was, for me, an amazing production. I’ve just got back from my annual Shakespeare week, having seen productions of both Julius Caesar and Antony and Cleopatra. They’re doing a Roman season at the RSC, so there’s a certain coherence to the staging and set design, which I really liked, and I think one of the things that struck me most about this production was its coherence: all the characters worked well together and the set enhanced the overall effect. And I was fortunate enough to have a seat in the middle of the third row, so the view was stunning. Brutus and Cassius made a really good pairing, and I got a strong, clear picture of the closeness of their friendship, and their centrality to the play which I did not have from previous readings of the play and filmed performances. We see the strength of the bond between them, the stresses and tensions it endures, and its survival to the bitter end: the scene of their quarrel in the Roman camp was very moving, particularly when it came to the news of Portia‘s death; despite his stoicism, Brutus’ humanity shone through as well. And the moment of their final farewells to each other on the morning of the battle, which I’ve always found effective even in a reading, was very touching. There were strong performances from other characters, too: Caesar’s physical weaknesses and frailties were well portrayed; Antony was clearly a chancer and a gambler, and the callow youth that Octavius was seemed very real, like an arrogant sixth-former who has just been chosen as deputy head-boy, polite and well-behaved but with a power-hunger just below the surface. It’s not a play with strong female roles; Portia worked for me, but Calpurnia didn’t: I just couldn’t see her as Caesar’s wife. I’m really glad to have finally seen a performance after having taught it so many times in the past; the BBC Shakespeare film version never really cut the mustard for me, so this really was a special treat. A youthful hero, plus some love interest – depending on how well the relationship between Hamlet and Ophelia is hinted at and played. Surely Othello, and Anthony and Cleopatra are in with a chance here? Shakespeare has a lot of themes up in the air in the play: a man’s duty (or not) to revenge his father’s murder. And yet, perhaps not so relevant today? A corrupt country, full of spies and surveillance. A hero who delays action, who is indecisive – perhaps an idea that many would be able to identify with. A hero with a very complex relationship with his mother, though this is also perhaps less in the foreground since Freud went out of fashion. A play about mental states, instability and madness; a play about acting, pretending and dissembling… Certainly there is a great deal here. And yet, I find that others of Shakespeare’s major tragedies have even more to say, move me even more deeply. Othello explores sexual jealousy and its consequences; although many of us have perhaps experienced this feeling, we have not responded in like manner. King Lear looks at the duties of children towards their parents and shows us ingratitude. Macbeth explores ambition: if we are ambitious, presumably we have not gone as far as he did, to achieve our goals? Love or infatuation in older age and the messes it can get one into: Antony and Cleopatra. But those are only ideas, you may object: what about the characters, and their relationships, presented to us on stage? Hamlet and his mother, Hamlet and Ophelia, for me pale before the power of the entanglement of Othello and Iago, his tortured relationship with Desdemona, and the touching closeness between Emilia and Desdemona. I think there’s a closer exploration of relationships between father and children with King Lear and his daughters, and it’s counterpointed by the pairing of Edmund and Edgar. And I find the interplay between Antony and Cleopatra, between Antony and Octavius, between Cleopatra and her women all quite riveting in different ways. Is it Hamlet’s youth that grips us, the young man with an impossible dilemma, the burden placed on his shoulders that he cannot cope with? Is it just that the play is too familiar that I feel it’s over-rated, that I feel a little jaundiced about it, in comparison with the other plays I’ve mentioned? Is it because I’m older than Hamlet and can no longer relate to his cause? Feelings at the end of the plays: usually I feel a sense of loss at the end of Hamlet. I feel overwhelmed at the end of Othello, King Lear, Antony and Cleopatra. Only Macbeth leaves me uninterested. I’d be very interested in others’ thoughts on this one. It nags at me, won’t go away and I’m unclear what to think. At the moment my verdict is good, but by no means the best. This is quite an early Shakespeare play, which I’ve enjoyed in the past, but found a little tiresome this time round, for a number of reasons. For one, the plot is tiresonely symmetrical: a king and three nobles woo a princess and three ladies; all are ultimately successful. And for each of the three courstships, the stages are alike: you would not find such a lack of variety later on in the dramatist’s career. The comic subplots using the clowns and other menial character I therefore found rather more humorous and diverting. The language is correspondingly limited, too: the blank verse is very structured, and very frequently moves into rhymed couplets, or alternate line rhymes, which grows tiresome after a while. There’s a great deal of wit and wordplay, much prized at the time and still very clever today, if you can penetrate it. 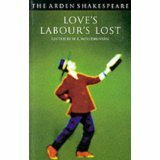 My preferred edition of the plays is the Arden (second series) which appeared over about forty years from the 1950s onwards; this being an early edition, it’s interesting to see the editor doing his best to avoid having to explain the vulgarities and obscenities that abound, or couching them in euphemistic terms. Later editors of other plays were nowhere near this circumspect. But often, to understand much of the humour, a twenty-first century reader does need glosses. I suppose my closest comparison for anyone not familiar with this play would be Romeo and Juliet, which was written maybe a year or so later. it’s a tragedy (obviously), but, if you look closely at the text, rather than watch one of the quite heavily edited film or stage versions, you will still see some of the rather tiresome overuse of rhyme, and leaden emotional over-exaggeration (the Nurse’s lament at discovering the apparent death of Juliet), over-long set-piece speeches (Mercutio’s Queen Mab speech) and other signs of a still-developing playwright. Just read it alongside Antony and Cleopatra and you will see what I mean. However, I always find it useful to be reminded that our greatest dramatist had to practise and learn his craft, and make a few mistakes along the way.